Election workers told CNN affiliate KETV in Omaha that the ordinance passed by nearly 1,000 votes. (CNN) -- Voters in Fremont, Nebraska passed a much-debated measure Monday that would prohibit businesses and landlords from hiring or renting to people who are in the United States illegally. Election workers told CNN affiliate KETV in Omaha that the unofficial results were 3,906 in favor to 2,908 against the measure; Workers said the turnout was 45.7 percent of registered voters. The results have not been certified. Ordinance 5165 had divided the community and put the city, just outside Omaha, into national headlines. A local organization decried the ordinance on its website. "It is with great disappointment and sadness that tonight we acknowledge a majority of Fremont voters approving this misguided ordinance," the group called One Fremont-One Future said. "In reality, the passage of this ordinance shows that we have much work to do in our community to educate, break down barriers, and build relationships." 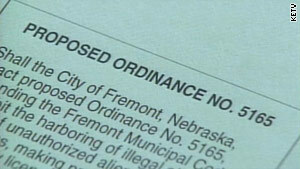 Fremont officials told KETV that they have plans in place that involve cuts in city services and tax increases to pay for legal fees associated with the passing of the ordinance. The American Civil Liberties Union has indicated that it will file a lawsuit -- pending approval by its board. Similar measures were passed in Hazelton, Pennsylvania, and Farmers Branch, Texas, but they were later struck down by the courts. In Hazelton, voters in 2006 approved a measure to enact practically the same law that Fremont is looking to take up. But in July 2007, a federal judge found that immigration laws should be left solely to the federal government. In May of 2008, a federal judge ruled the Farmers Branch measure, which would bar landlords from renting to illegal immigrants, was unconstitutional. "Those ordinances did not withstand legal scrutiny. They both failed in the courts when they were challenged," said Laurel Marsh, executive director of Nebraska's ACLU. The reason according to Marsh: Both laws violated the Supremacy Clause and the 14th Amendment. Under the Supremacy Clause in Article VI of the U.S. Constitution, state courts may not supersede federal law. In addition, she said, it's the federal government's responsibility to set immigration policy and "we are not well-served when communities or states try to set policy on their own." Gregory Minchak of the National League of Cities said that it's the lack of federal immigration policy that is causing these states to take matters into their own hands. "Because of the absence of the feds doing anything, there's a lot of financial, cultural, political strains that are occurring [in cities and states]," he said. "They are just starting to act on their own." The CNN Wire Staff contributed to this report.